THE RIGHT LAND. RIGHT NOW. Canadian Land Access Systems is an online communication platform designed to speed the process and eliminate the hassles of arranging and allowing land access. CLAS opens a convenient, cost and time-efficient conversation between land users and land owners. CLAS has no land access charge and is not pay for access. CLAS eliminates negotiating with land owners. CLAS protects our most valuable resource. CLAS ensures safety for owners and users. CLAS handles everything for a small one-time communication fee to the users and the cost of a sign for the owners. SIGN UP TO LIST YOUR PROPERTY. GAIN ACCESS YOUR FAVORITE SPOTS. Visit www.canadianlandaccess.com to open and personalize your account. Find land by name, address, longitude/latitude, land owner or access type. Use the calendar to request and schedule a day and time to access the property. Download the app. 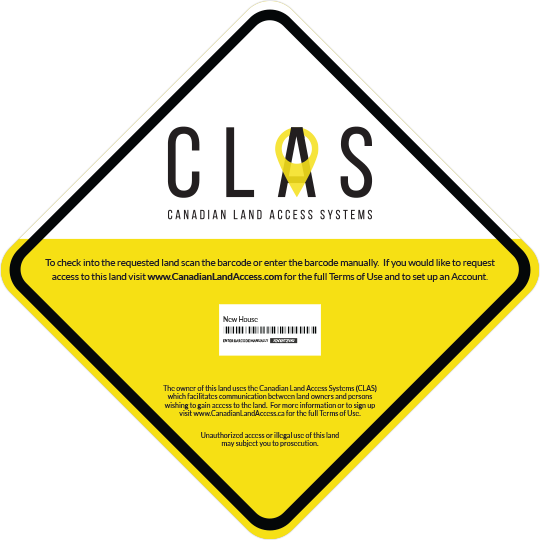 Go to the property; find the CLAS access sign. Scan in when you arrive. Scan out when you leave. CLAS provides privacy and protection for land owners. Know who is on your land and when. Discourage and be able to respond to property damage. Control access to your property easily and online. CLAS saves time and money for land users. Eliminate wasteful travel to arrange land access. Search the best hunting and fishing locations online. Compare properties without leaving home. Schedule company and service calls. Details: Access multiple lands multiple times at this one time fee for 1 month. Details: Access multiple lands multiple times for 6 months. You must subscribe to 6 months. Details: Access multiple lands multiple times at this annual fee. Membership and sign in is not required to access Alberta Conservation Association (ACA’s) and partner owned Conservation Sites as these are open to foot access. CLAS and the ACA strive to provide simple access to information, land locations and usage guidelines. For more information visit the Alberta Conservation Association website at www.ab-conservation.com or download the discover guide app http://www.albertadiscoverguide.com/.